We have an amazing assortment of fruit, vegetables, meat, seafood and other products, right here in Florida. So, next time you’re at the grocery store, choose Fresh From Florida. 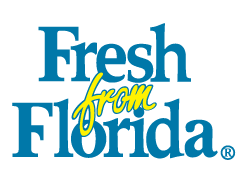 Not only are you getting locally grown food that’s fresher, you’re also helping support Florida farmers. With nearly 1,200 miles of coastline, Florida has a diversity of seafood options year-round. Whether growing indoors or outdoors, Florida has an amazingly colorful variety of plants that are perfectly suited for our subtropical climate.